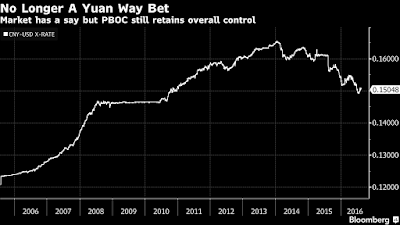 Back in July of 2005, China’s central bank broke a decade-long peg to the dollar. It’s an anniversary that attracted far less attention, but the move 11 years ago helped set the stage for China’s emergence as an economic superpower. Authorities pegged the currency back in the mid 1990s to stoke exports and economic growth, shortly after abandoning a dual exchange-rate system for imports and exports. Governments in the U.S. and Europe criticized China for running up a huge trade balance by keeping its currency artificially undervalued in their view. "In 2005, we were in a global supercycle, helped by an unsustainable credit boom in the west and China’s industrialisation and urbanization," Mann said. "In the last few years we have been seeing policy makers coming to terms with sluggish growth in the post credit boom west and east. China is easily the most dominant driver of global growth, accounting for a third of world growth even as it slows and transitions towards services and consumption." The yuan is set to join the International Monetary Fund’s elite basket of reserve currencies on Oct. 1. That entry could attract as much as $1 trillion of buying by global reserves managers. China also has opened a network of yuan clearing-banks around the world. But for all the hype, the yuan remains some distance from being viewed as a global reserve asset in the way that the dollar or euro is. While authorities preach liberalization, at the same time they have enforced strict rules on moving money out of the country after a record exodus in 2015. And some analysts still fear a steepdevaluation. For now, the lesson from 2005 is that shock currency events are ultimately just growing pains for a rapidly changing economy. With the passing of time, 2015 can be viewed in the same way, Bloomberg Intelligence economists Fielding Chen and Tom Orlik wrote in a note. 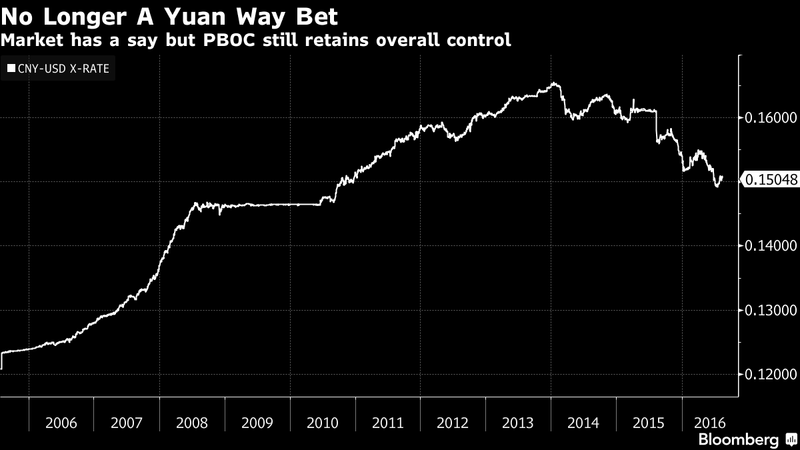 "A year on, the PBOC’s surprise move is looking less like a disastrous misstep, and more like a necessary evil on the path to a more flexible exchange rate regime," they wrote. "Significant progress has been made."